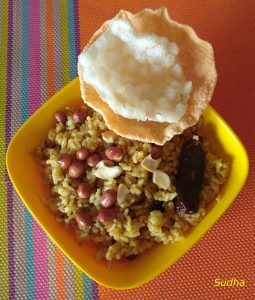 Tamarind rice is a common rice preparation in South Indian states Tamil Nadu, Andhra, Karnataka, Telangana. 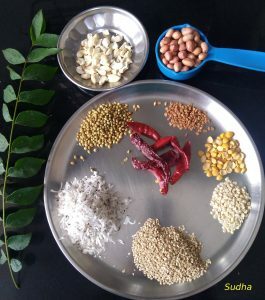 Puli means “Sour Taste” that indicates the taste of Tamarind which is the main ingredient in this preparation. There are different recipes for making this rice. Easiest is by using the ready spice mix. But I make it from scratch. It takes little time to make the spice mix. But the taste is awesome. 1. Soak Tamarind and ½ teaspoon salt in ½ cup water for 15 minutes. 2. Cook rice and spread it on a plate to cool. 3. Dry roast Fenugreek seeds, coriander seeds and 4 dry red chilies on low flame for a few minutes till you get nice aroma of roasted spices. Transfer to a plate and leave to cool. 4. Dry roast Sesame seeds till they start sputtering and change colour. Transfer to a plate and leave to cool. 5. Dry roast Grated dry coconut till light brown. Transfer to a plate and leave to cool. 6. Grind Sesame seeds and dry coconut together into a fine powder. Take it out in a plate. 7. Grind together Tamarind pulp, Fenugreek seeds, coriander seeds and roasted dry chilies into a fine paste. Add little water if required. 8. In a pan, heat 2 tablespoon of oil. Deep fry Peanuts and take them out on a plate. 9. In the same pan, deep fry cashew nuts and take them out on a plate. 10. In the same pan, add remaining Oil and heat it. 11. Add Mustard seeds. Wait for sputter. Add Asafoetida. Add Split Black Gram and Bengal gram and fry till light brown. Add split red chilies and curry leaves. 12. Add Tamarind Paste, Turmeric, Jaggery, Salt and mix. 13. Add ½ cup water. Mix and cook on low flame till the excess water evaporates and mixture is like a thick fluid. 14. Switch off the gas. 15. Gradually add cooked rice to the pan and mix. Add Sesame seeds and dry coconut powder and mix well. Add some fried peanuts and cashew nuts saving some for garnishing. 16. Mix well. Check salt and add more if required. Add Ghee (clarified butter) and mix. 17. 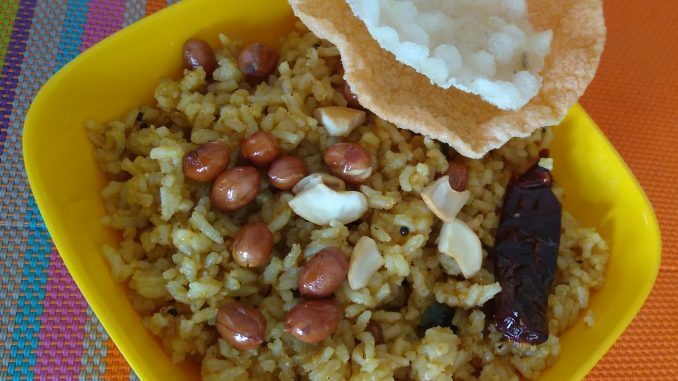 Yummy Tamarind Rice (Puliogare) is ready. 18. 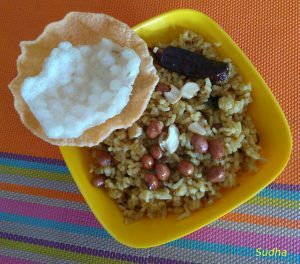 Serve with Fried Papadam. टॅमरिंड राईस हा दक्षिण भारतातील भाताचा प्रकार आहे. तामिळ नाडू, कर्नाटक, आंध्र प्रदेश, तेलंगणा ह्या राज्यात केल्या जाणाऱ्या रेसिपी त थोडा फार फरक असतो. यात वापरला जाणारा मुख्य जिन्नस म्हणजे चिंच. चिंचेची जराशी आंबट चव असलेला हा भात बनवायची सोपी पद्धत म्हणजे तयार मसाला आणून भात बनवणे. पण मी हा भात घरी मसाला बनवून करते. थोडा वेळ लागतो पण खूप चविष्ट भात बनतो. १. चिंच अर्धा चमचा मीठ घालून अर्धा कप पाण्यात १५ मिनिटं भिजवून ठेवा. २. तांदूळाचा भात करून एका ताटात पसरून गार करा. ३. मेथी, धने आणि ४ लाल मिरच्या मंद आचेवर सुक्याच भाजून घ्या. मसाले भाजल्याचा सुगंध आला की मसाले एका ताटलीत काढून ठेवा. ४. तीळ मंद आचेवर तडतडेपर्यंत भाजून एका ताटलीत काढून घ्या. ५. खोबरं मंद आचेवर गुलाबी रंगावर भाजून एका ताटलीत काढून घ्या. ६. तीळ आणि खोबरं मिक्सर मध्ये बारीक वाटून घ्या. ७. मिक्सर मध्ये चिंचेचा कोळ, मेथी, धने आणि लाल मिरच्या घालून बारीक पेस्ट बनवा. जरूर पडल्यास थोडं पाणी घाला. ८. एका कढईत २ टेबलस्पून तेल घालून शेंगदाणे तळून घ्या. तळलेले शेंगदाणे एका ताटलीत काढून घ्या. ९. त्याच तेलात काजूचे तुकडे तळून घ्या आणि ताटलीत काढून घ्या. १०. त्याच कढईत उरलेलं तेल घालून गरम करा. ११. मोहरी, हिंग घालून फोडणी करा. उडीद डाळ आणि चणा डाळ फोडणीत घालून लालसर रंगावर परतून घ्या. लाल मिरच्या आणि कढीपत्ता घाला. १२. आता कढईत चिंचेचं मिश्रण, गूळ, मीठ घालून मिक्स करा . १३. अर्धा कप पाणी घालून नीट ढवळून मिश्रण दाट होईपर्यंत शिजवा. गॅस बंद करा. १४. कढईत थोडा थोडा शिजलेला भात घालून मिक्स करा. तीळ आणि खोबऱ्याची पूड घाला. थोडेसे शेंगदाणे आणि काजू सजावटीसाठी ठेवून बाकीचे भातात घाला आणि नीट ढवळून घ्या. १५. चव घेऊन हवं असेल तर मीठ घाला आणि एकत्र करा. शेवटी साजूक तूप घालून एकत्र करा. १६. चविष्ट टॅमरिंड राईस तयार आहे. तळलेल्या पापडाबरोबर सर्व्ह करा.